Quinoa, pronounced keen-wa is one of those superfoods that’s been making headlines lately. A friend of mine wrote me a message last year asking me if I had ever tried Quinoa and saying “it’s all the rage right now”. I thought to myself, all the rage, really? I hadn’t realized it had become so trendy. I had been eating Quinoa for years and it never occurred to me that some people had never heard of it before. In fact, I later found out that 2013 was declared International Year of the Quinoa by the Food and Agriculture Organization of the United Nations (FAO). Quinoa is a wholesome and flavourful ancient grain that was cultivated thousands of years ago in Bolivia. Most commonly known as a grain, it is actually not a grain at all, but rather a seed and is now classified as a pseudograin for simplicity. In addition to its wonderful nutty flavour, the benefits of Quinoa are that it’s extremely easy to prepare, very versatile, extremely nutrient rich and a good source of zinc, folate and vegetable based protein due its high concentration of amino acids. Quinoa also has antioxidant and anti-inflammatory phytonutrients and is naturally gluten-free. What more could you ask for? Quinoa is probably my favourite “grain” or pseudograin and I use it in many recipes, for all meal occasions including breakfast, lunch, dinner, appetizers, salads and even cookies and other baked desserts. 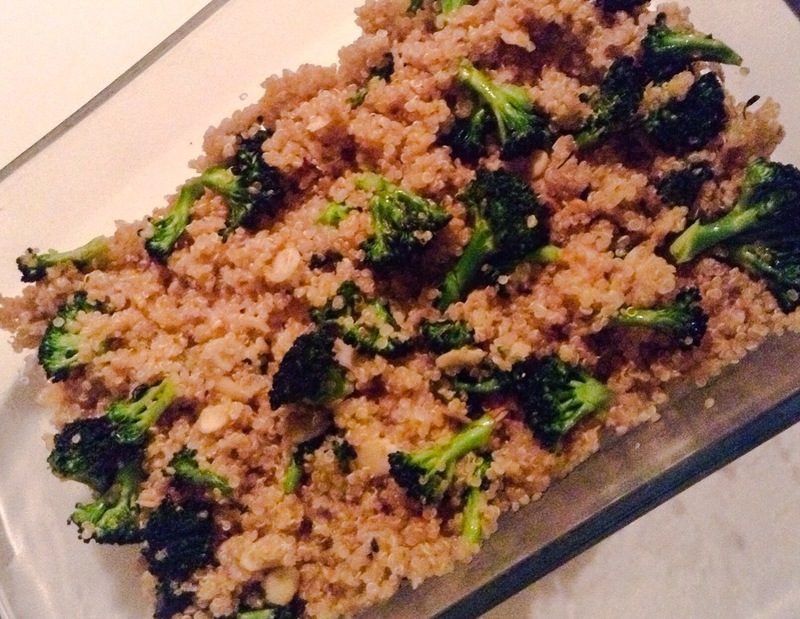 I picked up four heads of organic broccoli at the supermarket yesterday on the way home from work, so I decided to make a Quinoa & Broccoli Pilaf with roasted almonds, combining three superfoods to make a nutrient rich and flavourful dish. Thoroughly rinse quinoa in cold water and let dry in a colander. Heat 1 teaspoon of olive oil in a pot over medium heat, add diced shallots, and a pinch of salt to let the shallots sweat. Sautée for a few minutes until transparent. Add quinoa and mix to combine with shallots. Toast the quinoa for a few minutes, then add broth and water. Bring to a boil then reduce heat to low, cover and simmer for approximate 15 minutes until all the water has evaporated. Remove from heat and keep covered until ready to use. In the meantime, dry roast the almonds over medium heat until golden, being careful not to burn them. Remove from heat and set aside. Drizzle remaining teaspoon of olive oil into the pan and stir fry the broccoli florets until well cooked, but still crispy. Fluff quinoa with a fork and transfer to a serving dish. Top with broccoli florets and dry roasted almonds, toss gently and serve warm.